"The accommodation was great, right on th..."
Known for our good vibrations, friendly atmosphere and beach front location, it's easy to see why 80% of our guests are returning clients. At Billabong Surfcamp & School, we have everything you need, attracting like minded people from around the world to you just need to bring yourself. Awesome times, sunshine, waves, new friends and everlasting memories will be provided! Staying in one of our beachfront accommodations in the Billabong Surf Camp, you will be surrounded by palm trees and the sound of the ocean. Our beach house offers 2 shared dorm room, 2 bathrooms, a shared living room and kitchen. Upstairs you find the private double room with sea view and ensuite bathroom. Moreover we have a 6 apartments in the Camp, all with oceanview and views to Lobos island. The Camp can accommodate up to 35 people. Our big shared garden area with BBQ, hammocks, sun beds, slackline etc is the perfect place to meet all the other guests and hang out together after surfing. All our guests have free use of our Paddle boards, Kayaks, Skateboards, Snorkel equippment & more. Surf lessons & equipment rental is all available on site. The Camp is located directly on the beautiful Waikiki beach in Corralejo. From the Camp it is a less than 5 minutes walk to the city centre. Corralejo offers a lot of shops, very good restaurants, supermarkets and bars. The accommodation was great, right on the beach and much nicer than I anticipated. The apartment was large and spacious with huge lounge windows overlooking the courtyard area and beach. Really stunning. We were in apartment 2. We had 2 bedrooms, one double room and a twin which was perfect for us. There was plenty of wardrobe space and storage throughout and a large kitchen lounge diner that had everything we needed. Our host was charming, friendly and helpful. You could tell he took great pride in his surf school. The free use of paddleboards, Skateboards and kayaks was great for us to keep busy when we weren't surfing. The courtyard on the beach is a really nice area with two hammocks and lounging areas. Ideal when it gets a bit windy on the beach. My daughter is Vegan and it was hard to find food for her locally which was expected to be fair but there are Vegan restaurants around, although not all are open in Easter when we were there. Our instructor Guilio was fantastic and really made our holiday. He was funny amiable and always calm and friendly. Even on days where the surf was not great or too hard for us to enjoy, he made the days out really special. Please pass on our thanks. The accommodation was great. The only slight issue was that the bedroom was a bit damp, which is usual for accommodations on the beach front. Otherwise, everything was excellent and very clean. The instructors were all excellent and had their own style. I think stretching should be part of the lessons as well as some theory for the absolute beginners. Accommodation was extremely comfortable, people have been exceptional. Billabong House Fuerteventure was awesome. Directly on the beach. While you don´t surf directly on this beach (beach break took away surf), it´s one of the most relaxing beaches and right in the center of town. Could not recommend the location for the stay more. The town is nice, lots of night life if you´re into that as well as great restaurants of all sorts. The hostel was perfectly placed and the surrounding restaurants were great. The people were friendly and the stay was comfortable and enjoyable. The surf lessons were good. The instructors were amazing teachers and I got to stand up on my board within a couple of sessions. The beaches were beautiful with fantastic sandy beaches and waves. I don't stay in dorm rooms too often, but there was no other availability when I was booking. if you staying in a shared accommodation the entrances is from the beach. I am beginner, I took my time and I uber enjoyed the whole expirience, teachers were great - mostly spoke with Gulio and he explains things well and makes you feel welcome. The accommodation was very good, fantastic location (honestly it's perfect). Was clean and well maintained and probably the perfect size for the number of residents. Corallejo is awesome just enough night life and restaurants etc. to keep you entertained but not too much to make it overwhelming. Banana bar, Waikiki and El Toro Bravo we up there as favorites. Proximity to the stop is good too and you can find everything you need within 5-10min walk. The Beach House offers 2 dorms rooms, each offers 6 beds and an ensuite bathroom. The Camp disposes of a fully equipped kitchen and a communal living area with flatscreen TV to be shared. The price includes linen, towels and a cleaning service. The Beach House has a fully equipped kitchen and a communal living area with flatscreen TV to be shared. 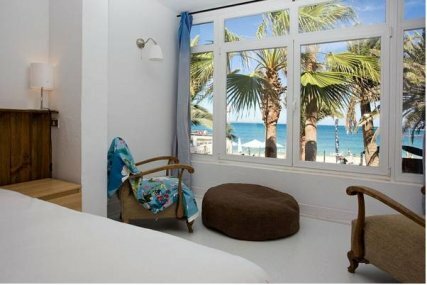 The Studio offers a stunning seaview and disposes of 2 double beds, a seating aera, a kitchen and a bathroom with shower. It is located on the first floor of the Billabong Surf Camp. Each days lesson is 4 hours long and we take you to best surf spots on the island depending on the conditions of the day. All equipment is included. A 4 hours long 1 to 1 surf lessons - we take you to best surf spots on the island depending on the conditions of the day. All equipment is included.